Yup, done already. Thought it'd be much harder to get School of Hard Knocks, but it just took one visit to each battleground and a nice death knight to drop the flag for me to pick up on EOTS and the achievement was mine. 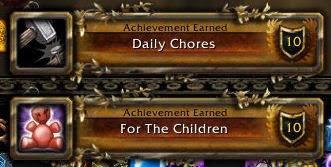 I also thought that Daily Chores would be annoying, but apparently, the tooltip is wrong and you just have to completely 5 daily quests with your orphan out, not on 5 different days. Additionally, in Shattrath, I was able to earn Veteran Nanny as my pet collecting had started a couple years ago. So here I sit, Patron Tiddlywinks with little to do for the rest of the day.